An exciting new initiative which aims to increase access to British independent and world cinema in areas where there is otherwise little or no film provision will bring the magic of the big screen to community venues in parts of Rhondda RCT, Ebbw Vale and Bridgend over the next six months, offering something for all members of the family. 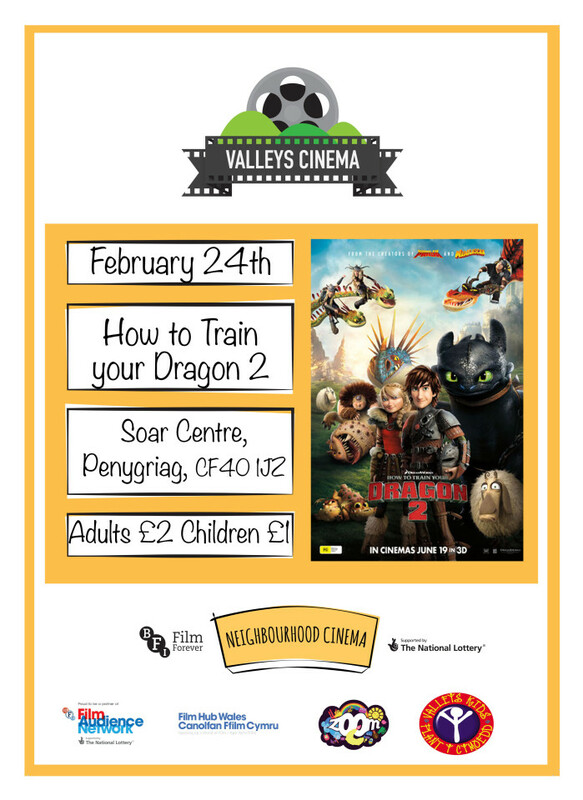 The first movies start rolling on Tuesday 24th February, which include How to Train Your Dragon 2 and A Most Wanted Man, at Valleys Kids’ Soar Centre in Penygraig and the Ebbw Vale Institute respectively. Other venues including Valleys Kids at Penyrenglyn, Rhydefelin, and The Factory in Porth are participating. Maesteg Town Hall in Bridgend is also offering an extra special film and tea dance event. Moviola will provide equipment to screen the films and content will come from thier vast film catalogue. They already have a relationship with over 20 existing venues in South and Mid Wales through their film booking and advice service. Longer-term, the pilot scheme is hoping to be successful enough to set up a regular film programme or access to a diverse year-round cultural programme in each area. Ticket prices vary from just £1 – £5 and should be booked in advance where possible. See individual venues for full screens and times. Valleys Kids, Soar Centre, Penygraig. The Valleys Cinema Team, ArtWorks and Zoom Cymru have been working together on a project called Valleys Cinema. We will be bringing cinema to your communities across RCT over the next few months. We have showings in Penygraig, Penyrenglyn, Rhydyfein and the Factory in Porth so make sure you keep your diaries free. The first film we are privileged to be able to bring to Soar Centre is ‘How to Train your Dragon 2’ and will be shown at 6pm on Tuesday 24th of February. Tickets will only cost adults £2 and Children and Cons £1. We hope to see you all there.